Barbosa Wins 4th Odisha Int’l GM Chess Championship. GM Oliver Barbosa, the Philippines’ first qualifier to the Chess World Cup 2013, once again proved his worth and mettle by delivering sterling performances and winning solo first place in “The 4th Odisha International Grand Master Open Chess Championship” also known as “KIIT CUP-2012” that took place from 30th May to 5thJune 2012 at KIIT University, Bhubaneswar, Odisha (formerly Orissa), India. Seeded 5th among a strong field of 150 rated players, the tourney with 1-Belarusian Super GM (SGM), 2-Russian and 1-Indian GMs in the top 4, Barbosa overcome the odds and completed the 10-round Swiss System “Standard” chess scoring a whooping and exceptional 8.5/10 (7wins & 3draws) points with a performance rating of 2648 and a +14.4 gain in rating points. 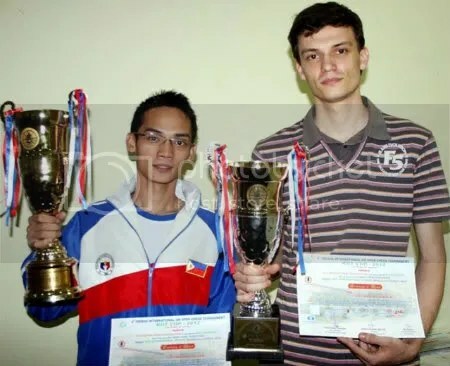 Previously, last 5-13 May 2012, he also had gained a +10.8 rating points at the “Asian Continental Chess Championship 2012″ in Ho Chi Minh, Vietnam. These brings his “Live Rating” to 2575.2 and just 24.8 points short for a Super GM status (2600+). Barbosa, who snatched the sole lead from Russia’s GM Nikolai Chadaev with an impressive win in round 8, settled for 2 consecutive draws in the 9th & 10th rounds and finished half-a-point more than the 2nd to 6th placers GM Chadaev Nikolai of Russia (2nd), IM Grover Sahaj of India (3rd), GM Hoang Thanh Trang of Hungary (4th) , SGMPodolchenko Evgeniy of Belarus (5th) and IM Vaibhav Suri of India (6th) who all scored 8.0/10 and whose respective standing were determined by Buchholz tiebreak point system. 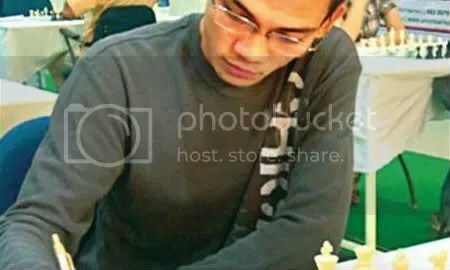 Aside from Barbosa, two other Filipino Grandmasters participated in the 4th Odisha championship are GM Gomez, John Paul who scored 7.5/10 (10th) and GM Paragua, Mark 7.0/10 (14th). 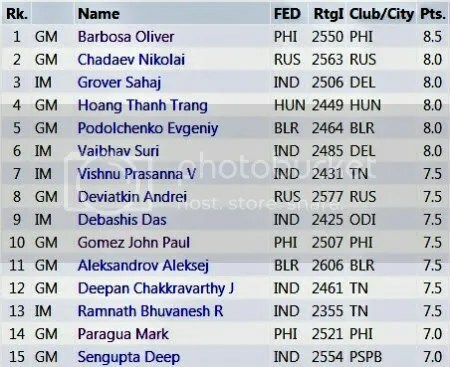 Per this blogger chat with GM Barbosa, just after he was declared as the Champion, the 3-Philippines GMs are to proceed and participate in the “5th Mayor’s Cup International Open Chess Tournament Mumbai” scheduled to take place from 7th to 15th June in Mumbai, India. KIIT Cup champion Oliver Barbosa (Left) and runner-up Nikolai Chadaev with their trophies in Bhubaneswar on June 5, 2012.